Is Kevin sharpening the knife? SUPPORT for the Labor government has fallen to 27 per cent, its lowest point in almost four decades, while Julia Gillard’s personal ratings have collapsed to levels not seen for a prime minister since John Howard introduced the GST more than 10 years ago. 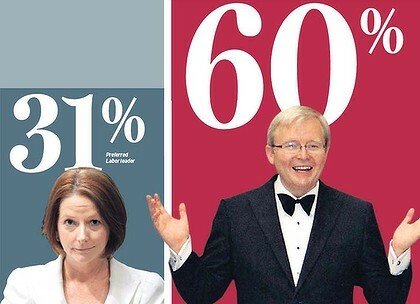 The latest Herald/Nielsen poll also shows that a week away from the first anniversary on June 24 of Kevin Rudd’s dumping as prime minister, twice as many voters prefer Mr Rudd as Labor leader to Ms Gillard. The poll, taken from Tuesday to Thursday night, contains a sliver of good news for Labor in that support for putting a price on carbon has jumped 4 percentage points in a month to 38 per cent. But the government is in dire straits. A little more than one in four voters would choose Labor first should an election be held today, and almost 60 per cent disapprove of Ms Gillard’s performance. She urged her colleagues to hold their nerve, suggesting that unlike Mr Rudd a year ago, she had a strategy to turn things around. ”We’ve got a plan which we are working through to deliver, which we did not have at the start of my prime ministership,” she told the Herald. Since the last poll a month ago, Labor’s primary vote has fallen 4 percentage points to 27 per cent – the lowest primary vote for any main federal party in the poll’s 39-year history and the first time a major party has fallen to less than 30 per cent. The Coalition’s primary vote rose 2 points to 49 per cent, giving it a two-party preferred lead over Labor of 59 per cent to 41 per cent. This represents a 9-point swing towards the Coalition in the 10 months since the election and is the Coalition’s biggest lead since May 1996, two months after John Howard trounced Paul Keating. When John Howard wanted to hit us with a GST, he had the brains to call for a national election first, so we ordinary folk could register our opinion via our votes. So how is it that PM Julia Gillard won’t do this to prove her belief in the Carbon Tax and EST ? Is it simply that she herself doesn’t believe in it ? After all, a national election would certainly prove the point one way or the other. In Pirates of the Caribbean, Jack Sparrow saves the shot given to him by his mutineering first mate, Barbossa. I wonder if Kevin has saved the knife. So Carbon Cate was worth 4 points in the campaign to bring in the tax on everything. Exceedingly poor value for money, methinks. At this point you’d have to be a very brave person to go betting on the outcome of the next 6 months. Negotiations dragging on, popularity plummeting, Rudd scheming. All that and having to keep every single MP on board and singing from the hymn sheet. The Fairfax Universe is one of the few places where 59 is less than 41. Gillard is finished but so what., Rudd is probably a bigger warmist then Gillard, Even Abbot declares that he believes in the science of global warming and indeed even has a direct action plan to cool the planet by planting millions trees, When will this BS end? Without going into details at all, at least planting trees is something vaguely useful. It won’t do anything for the global climate, but I think its a more sensible concept (relatively), than the very badly disguised wealth redistribution scheme that Labor & the greens are pushing for, which will, in my opinion, ruin the economy, and not change how we think about energy consumption at all, and it certainly wont do anything for the environment. Sure Abbots direct action climate cooling plan it is preferable to Gillards everlasting ever increasing tax,but that would not be hard. Can Australia really afford any of this crap.